Most AV-rooms have got one or more cameras installed. 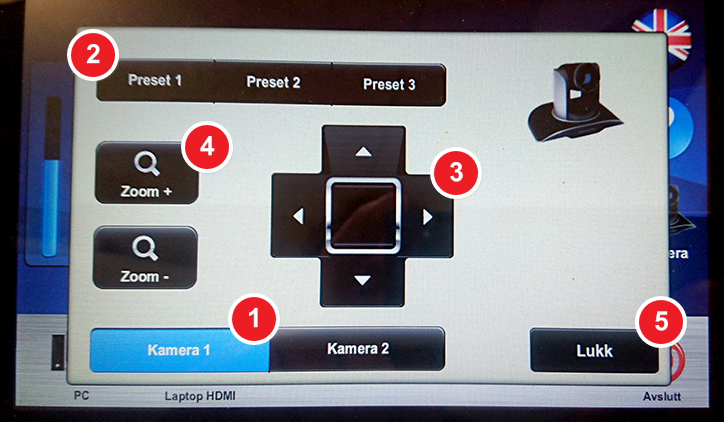 You can control these cameras with the Creston Control panel. The panel usually resides right next to the computer, on the tabletop. Note: the cameras send videosignals to the PC on the lecture table - not to externally connected laptops. Choose between the different cameras, if there are multiple cameras in the room. Presets lets you switch between different predefined positions for the selected camera. The arrow keys lets you make manual changes to the position in 4 directions. Zoom in and out to come closer or move away from whatever is the main subject. Zoom inn og ut for å komme nærmere eller fjernere det som skal tas opp. Press Lukk (Close) when you are satisfied with your adjustments. You will return to the front page. Rooms sporting videoconference equipment may have additional cameras installed. If you are not allowed access to the camera controls for these particular cameras using the Control panel, please look for a remote control laying about in the room. The remote control should give you access to many of the same controls as described in the foregoing paragraph.